Let us settle ourselves, and work and wedge our feet downward through the mud and slush of opinion, and prejudice, and tradition . . . till we come to a hard bottom and rocks in place, which we can call reality, and say, This is, and no mistake. It was the middle of the worldwide Industrial Revolution and life was changing quickly when Henry David Thoreau (1817–1862) retreated to the environs of Walden Pond near Concord, Massachusetts, on the 4th of July, 1845, to live deliberately in a one-room hut he’d built on a woodlot belonging to Ralph Waldo Emerson. The two-hundredth anniversary of the famous Transcendentalist’s birth has been marked by celebrations in his hometown of Concord, the release of a commemorative stamp by the USPS, and a traveling exhibition—opening at the Concord Museum on September 29—of Thoreau’s exuviae (a word Thoreau uses to refer, dismissively, to worldly belongings), including more than twenty of his journals, his goose quill pen, and the green-painted white pine school desk he used in his cabin in the woods. 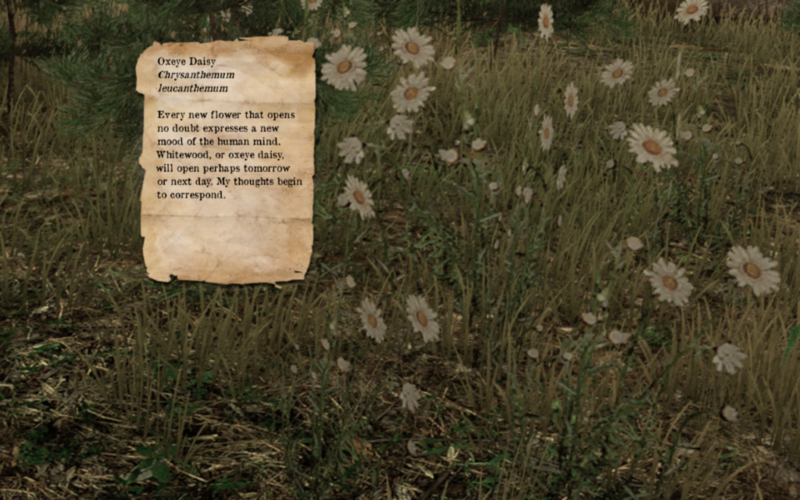 But the most intriguing tribute is surely Walden, a game. 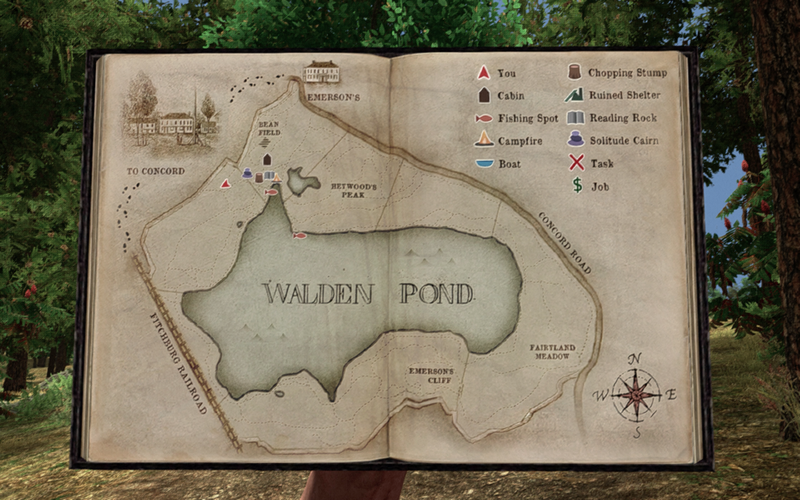 Produced by USC’s Game Innovation Lab, Walden, a game lets you (virtually) experience what Thoreau’s life was like during the two years, two months, and two days that he lived at Walden Pond. 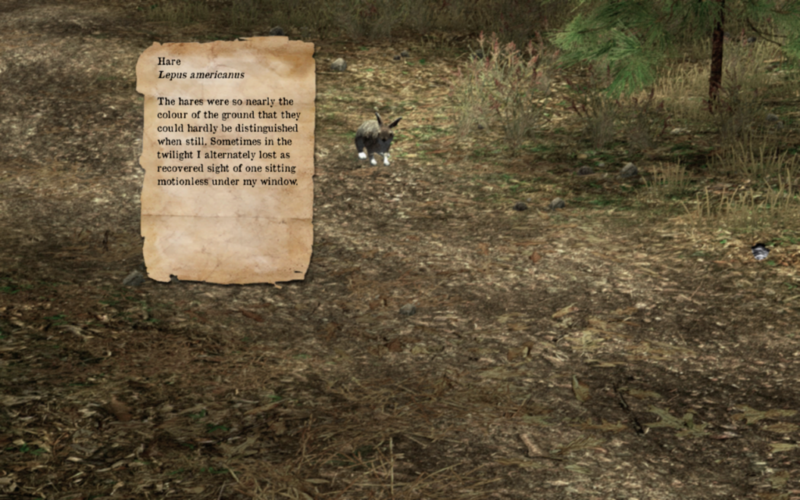 The game belongs to a burgeoning genre known, somewhat pejoratively, as “walking simulators.” It’s in first person, and by using keyboard commands you can perambulate a simulated environment. 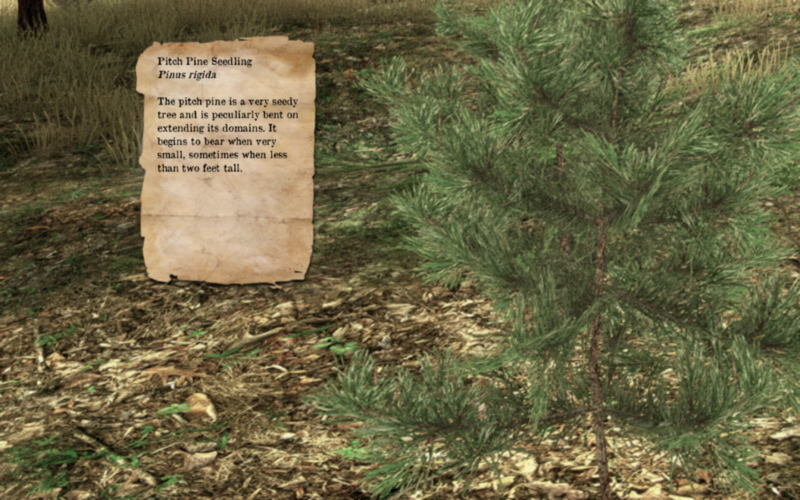 Trace uncomplicated figures using your mouse or trackpad to build your own cabin, forage for food, and mend your sensibly simple clothing. Food for thought is as important to survival as physical food (if you lose your inspiration, the woods will turn grey). Talk to Ralph Waldo Emerson, correspond with Nathaniel Hawthorne, read the Illiad, and work on Civil Disobedience after being thrown in jail for non-payment of taxes. 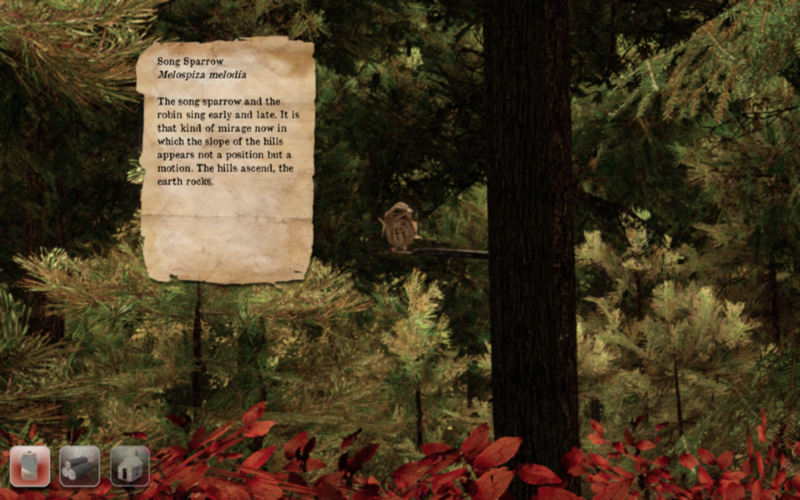 You can also get inspired by inspecting the flora and fauna. 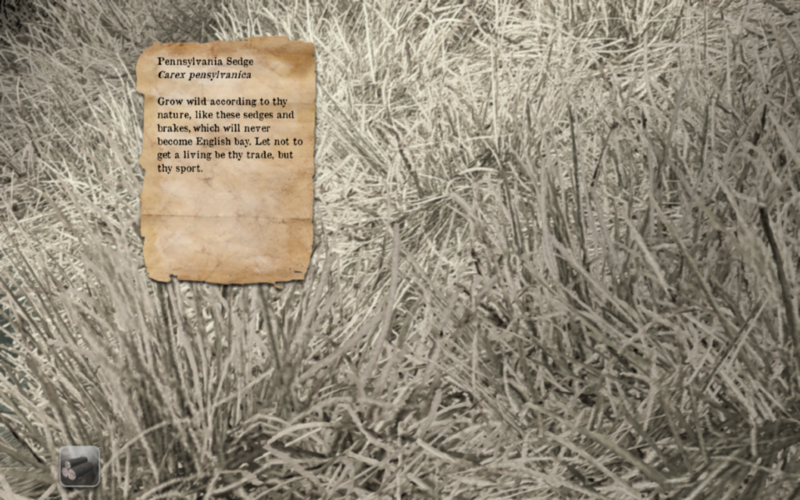 Right click on oxeye daisies, Pennsylvania sedges, pitch pines, hares, song sparrows and other living things to reveal Thoreau’s pithy comments on each species. The game’s designers used federal geographic data in combination with period maps and Thoreau’s surveys of the pond to create a game level that very accurately reproduces the 1840s’ topography. The game’s sound designer, Michael Sweet, walked the woods with an expert from the National Audubon Society, who indicated which birdsongs were ones Thoreau himself would have heard, taking into account changed migration patterns and habitats. In the game, the symphony of ribbits, trills, moos, hoots, and squawks changes throughout the day and from season to season.